A Balinese Cremation Ceremony – snackettes. On the day of the ceremony, Futu instructed us to walk up the road from our bungalow around noon and stand near the village temple where the rest of the village would be gathered. As we made the hot trek up the hill, many others were rousing from their homes to head in the same direction. Much to our surprise, the mood was festive, as if we were on our way to a parade. 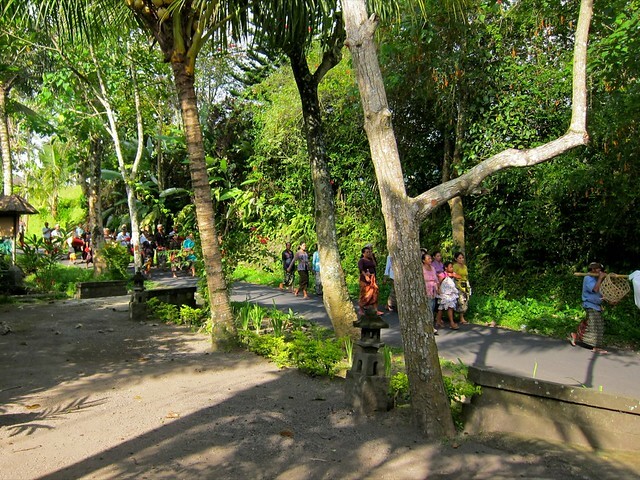 We stopped near the temple and passed the time surprising those around us with our 3 or 4 Balinese (as opposed to more common Indonesian) phrases: “Kin Kin Cabaree?” (How are you? ), “Sing Kin Kin” (No worries), “Sooksumu” (Thank you), etc. The first sign of the ceremony was the drum: a deep, evenly spaced, hollow thump. This was accompanied by a more rapid tinny chorus of miniature gongs, which turned out to be gamelans (used in traditional Balinese music). Playing these instruments was a marching band of sorts, packed into a larger group of people – most of the village, we later found – dressed in traditional clothing with women carrying large offerings on their heads. Their repeating tune was somber and pronounced, communicating the seriousness of the moment. As the crowd approached, we got our first glimpse of the body of the deceased. It was wrapped in sheets, laid out on a slender, intricately decorated wooden sleigh that was hoisted using crossed bamboo bars onto the shoulders of at least 15 men. Behind them, more men carried a twisted sheet that represented the deceased’s spirit. If we hadn’t known better, we might have assumed that this many men were needed to handle the mere weight of the sleigh, but that wasn’t the case: more importantly, many men were needed because they were all, frankly, shitfaced-drunk on arak, the local coconut wine! But their drunkenness was not due to sorrow or irresponsibility. In fact, the stumble they’d developed was key to their ceremonial tradition: the sleigh must be carried in a zig-zagged path that not even the men could retrace, so that it is impossible for the deceased’s spirit to catch the body and reenter it! We turned down a dirt road that led to a flat area of the rice fields where they’d been preparing for the day’s event. This area was also the village cemetery, but it was empty at the time as bodies are only kept there until the family of the deceased has the money to dig them up for a proper cremation. Upon arriving at the cemetery, the men dropped the sleigh in an expectedly sloppy manner and removed the corpse, carrying it on their shoulders toward the funeral pyre. Before placing it on top, they ran it in 3 drunken circles around the pyre, pulling and twisting the body, further disorienting the spirit and themselves in the process. As they ran, another group followed them carrying an empty “decoy” spirit sheet to throw off the real spirit even further. Meanwhile, the now-empty sleigh was hoisted and pitched down the side of a ravine, then set on fire, never to be used again. We later learned that the sleigh often costs the family at least 25 million rupiah (2,500 US dollars) – a hefty fee that often forces families to sell their possessions, such as precious farm land. Once the body was placed atop the pyre, the men unwrapped it, and crowds gathered around to view it and sprinkle it with holy water and offerings. Futu advised, “we should move upwind now; the smell of the cremation is usually not good.” As we moved, the priest – an elderly woman this time – finished the blessings by spreading the last of the holy water, while the men drank even more arak and began to assemble the fire. Two 8-foot-long gas torches were placed underneath the body, hovering above a metal tray to collect the ashes. With torches spewing gas, they struck a match and the whole stack went up in tall, powerful flames. Within minutes, all wood and coverings involved in the fire fell away, leaving the hundreds of people in attendance with a plain view of the deceased’s naked body burning in the violent flames, which were so strong they sounded like a small jet engine. Out of respect to the family and our readers, I don’t wish to describe how it was to watch a human body being reduced to ash; I’m not even sure I could. Despite our shock, what was infinitely more striking about the hour or more that it took to complete the cremation was the mood that continued amongst the crowd: children laughed, men hugged one another while telling jokes and sipping Tuoc (homemade coconut wine), the gamelan players and drummers stepped up their hypnotic tune, and the women sat together and occasionally delivered more offerings to the pile near the fire. The son of the man being burned before our very eyes walked around with a smile, offering his friends a celebratory smoke. There was even a concession stand where people were buying frozen popsicles (! ), and a man sat next to me and offered a tall cup of tuoc that I graciously accepted (pictured behind me below). Every person in the village was in attendance, regardless of age or relation, just as they would be for a wedding, birth, or any of the many other ceremonies that are honored each week; they were celebrating just another aspect of what they believe to be a very circular, rewarding, and fortuitous life. The mood was at once solemn, jovial, and wistful; a fitting way to memorialize the life of their friend. To be sure, Balinese people are no more immune to grief than anyone else; as one would expect, and as Futu confirmed, the family of the deceased spent days mourning their loss. But it was moving to watch their grief transform into happiness as they carried out their rituals; they really knew that the spirit was free again to live on again one day. Through these weekly village-wide ceremonies, the Balinese live in constant reminder of all stages of life, and if what we observed that day was common, it seems they’re able to accept death a lot more easily than I can. Back home, we have similar ways of thinking about death, but it’s easy for us to ignore it when it’s not affecting us personally; maybe because of that, we allow ourselves to forget how best to cope when it inevitably returns. After the fire went out, the men gathered the ashes in a coconut shell and marched them down to the valley. They sent the ashes down the river which would soon carry them out to sea, and soon a purification ceremony would complete the spirit’s transition back into the family’s temple until it reincarnates again. We watched them pass by from the side of the road with Ketut and Futu, sharing our thoughts on the day’s events. Among other things, we mentioned how incredibly hot it was that day, and Ketut nodded, “I believe that’s because it makes the cremation easier. There are people in the village who can make sure it is very hot on occasions that we need it to be; they can try to make the rain hold off until later.” Indeed, oddly, the daily afternoon shower had not yet arrived as we prepared dinner that night. As Ketut said farewell for the night, he looked out across the cloudless sky and added, “It looks like the rain will come now that the cremation is over.” After dinner, we locked up the kitchen and retreated to our bungalow for the night – just in time to hear the rain move in across the valley.